Leading Manufacturer of thermic fluid pump from Ahmedabad. Max Flow Rate 250 M3/hr. We are leading manufacturer & exporter of Thermic Fluid Pumps. 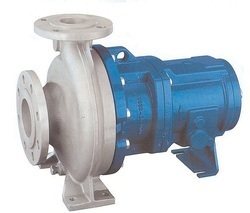 "JEC" made thermic fluid pumps are Centrifugal Pumps in Back Pull-out Construction, Horizontal, Center line Mounted, Single stage, End suction and Top Centerline Discharge Suitable for Thermic Fluid & Hot Oil also. Impellers are provided either with Back Vane to minimize Axial Thrust and Gland Leakage. Flange Rating PN 16 and drilled to DIN standard to meet ISO 2858 requirements. Mechanical Seals ( Single Spring / Metallic Bellow). Standard Bearing / Special Heavy Duty Bearing arrangements available.